says The Weather Channel's Jim Cantore. Heliconia, also known as the false Bird of Paradise, are ubiquitous in Belize and lend themselves to enhancing your yard and gardens. Here are some facts about this wonderful member of the banana family. Heliconia is named after Mount Helicon, the seat of the Muses, the nine goddesses of the arts and sciences in Greek mythology. The Heliconia's bracts are so large and colorful that they almost hide the flowers altogether. This keeps the flower's sweet nectar from other birds so that only specialized birds can get to it. Heliconia has oblong leaves growing opposite one another on nonwoody stems, often forming large clumps with age. Heliconias are grown as landscape plants. Heliconis grow to a height of 3-30 feet in height. There are some species of Heliconia which have upright facing flowers. Some heliconia flowers droop down from the main stem and are called hanging heliconia. CPC Real Estate Solutions is pleased to announce that Michael Young, one of the principals of the company, has been awarded Special Constable status by the Belize Police Department. Michael took the time and the initiative to complete the special course under the auspices of the Belize Police Department. "I found that with some of the resources I have at hand, that I could be of assistance to the Hopkins Police should the occasion arise." Michael also finds time to sit on the board of the Hopkins Humane Society and is a very active member in the society's efforts. For more information on the Humane society, please click here. And that beach is much more enjoyable when it's cleaned up. That's what Albert Nunez, President of the National Garifuna Council, and his team of volunteers have been doing in Hopkins recently after mother nature and her storms dumped logs and debris on the shores of Hopkins. The popular Edmonton, Alberta Recreation & Investment Real Estate Show saw a cooperative display effort from Sarkiki Reef Resort and CPC Real Estate Solutions this past September. Lea Snyder of CPC, found the exposure given to Belize was of interest to the many visitors who attended the weekend event. "Alberta has always had a strong representation of individual and corporate investment in Belize and that interest has not diminished due to their strong economy" says Snyder. 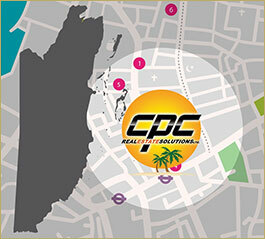 CPC has plans for more participation in similar shows to promote their clients interests in marketing their properties and spreading the good word about Belize in general. Resources will support land security and help create a dynamic land market The Inter-American Development Bank today approved a $2.5 million loan to Belize to assist the government establish a more dynamic and efficient land market by improving country-wide access to land management services, their quality and efficiency. Hopkins Harbor Developments is on the move again! Last year's economic setbacks, have affected every development worldwide and Hopkins Bay Developments is no exception. As a result, management has decided to focus on their triplex and sixplex projects. The 40 acre Hopkins Bay Resort property on the sea front, and bordering Fresh Water Creek, will also bring to market 81 new residential lots. This economic downturn, having affected businesses and individuals worldwide, has had some affect on pricing in the south coast areas. Most CPC listings remain static in pricing, although there are some exceptions. A small beach lot in Phase 2 of Sittee Point Estates is selling for US$ 90K, another standard 50X125' in P-2 is priced to sell at $97K. Phase Four offers five lots at this time, beginning at $199K.